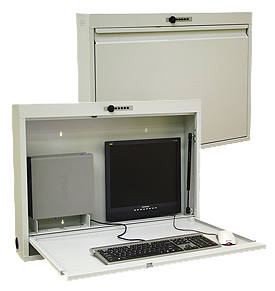 This full-size wall desk provides a solution for your information technology storage and security needs. This versatile workstation has ample space for CPU, monitor, keyboard & mouse. Colors: beige & light grey (Contact Franklin Mills for custom color options). Construction: heavy gauge steel, Size: 241⁄2"H x 32"W x 6"D. Contact Franklin Mills for special pricing.